Four generations of passionate research into marine engines, composite materials, hull design, rational and elegant interior design, turning a family tradition into a philosophy of pleasure boating. Full range of power design from open boats to fly bridge to 100'+ motoryachts. Web Site Snapshot: If available, above is a snapshot of the Guy Couach web site at http://www.couach.com/ as it appeared when this site was added to the directory or last verified. 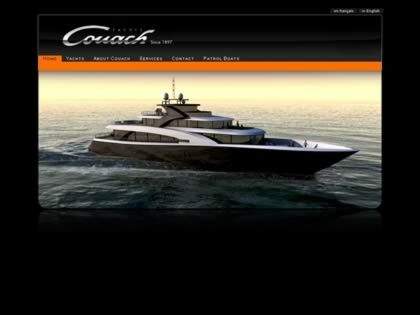 Please Note that Boat Design Net has no involvement with the above web site; all content and images depicted in the above thumbnail are the property and copyright of Guy Couach unless otherwise noted on that site. Description: Four generations of passionate research into marine engines, composite materials, hull design, rational and elegant interior design, turning a family tradition into a philosophy of pleasure boating. Full range of power design from open boats to fly bridge to 100'+ motoryachts.